thousand people in moving and trucking. 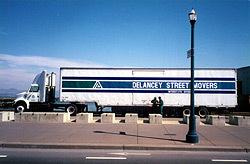 Delancey Moving and Trucking has been in operation in California for over 32 years. We design and construct all our own dollies and other rolling stock and provide full service moves including packing and crating of safes and pianos. 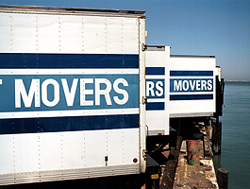 We are available for office and household moves, furniture or equipment reconfigurations, and corporate relocations. Delancey Street is the largest independent moving company in the Bay Area, with an average of 5,100 moving jobs annually. We are currently under contract with several large organizations, including The Gap, Inc., the County of San Mateo and the San Francisco Giants. We do more than 500 moves a year for these groups alone. We move the entire Giants baseball team from their home in San Francisco to their spring training facility in Arizona. Each year, for two weeks before each election in San Mateo County we pick up voting machines and deliver them to all voting sites. We provide daily moving services for the Gap Inc. using at least 3,600 man-hours a year. Whether moving households or entire corporate offices, Delancey Street has the equipment and the manpower to get the job done well. We have moving offices in New York, New Mexico, North Carolina, San Francisco and Los Angeles. Our home moves have been favorably commended with hundreds of reference letters each year. We are very proud of our moving company. We will work hard to assure that you will be pleased with our services. Call us at (415) 512-5110 and let us show you why we have been consistently selected as the Best Moving Company operating in the Bay Area. We have been accredited by the Better Business Bureau since 1988 and have an A+ rating (with no complaints in the past 36 months (standard reporting period). We look forward to hearing from you. The National Diesel Trucking operation consists of classes for students conducted on a year-round basis and includes knowledge of and practice in the operation of diesel tractors. Delancey Street’s diesel rigs run a regular circuit from San Francisco, Los Angeles, New Mexico, North Carolina to New York and return on a continual basis, requiring not only truck driving skills but knowledge of U.S. Department of Transportation rules as well as those enforced by state and local regulatory agencies. Delancey Moving, an aerial view.